helping to shape a better arizona. Virtually no corner of our global economy was left unscathed by the crushing impact of the Great Recession. In Arizona, the effects were made worse by the rancorous debate over immigration. Times have changed. Today, the world’s economy is rebounding. Arizona’s major industries are reclaiming pre-recession strength. Federal immigration reform legislation seems to be within reach. Helping to lead the way have been the Arizona Hispanic Chamber of Commerce and the Tucson Hispanic Chamber of Commerce, our growing corporate and government partners, and the indisputable evidence that Latinos are vital to the state’s future economic prosperity. It’s hard to argue with facts. Arizona Latinos are now one-third of the state’s population, and by 2035 we will be the state’s majority. Arizona is now home to more than 67,000 Latino-owned businesses. One-third of those companies are owned by Latinas and one-third are owned by immigrants—the vast majority from Mexico, punctuating the intrinsic value of our cross-border relationship. Corporate Arizona, meanwhile, understands more than ever the value of supporting Latino- and immigrant-friendly community outreach and marketing campaigns. It’s no wonder. Consider that Tucson’s total average purchasing power exceeds $4.4 billion, contributing to statewide Latino consumer spending of an estimated $43.3 billion this year. Nationally, Hispanic buying power has reached $1.3 trillion, a figure greater than the economies of all but 13 countries in the world. Add to these trends the growing economic clout of the state’s 100,000 minority-owned firms, prompting more than a dozen major corporations to join the Arizona Hispanic Chamber’s “Million Dollar Circle of Excellence,” which recognizes companies that do $1 million or more in business annually with minority-owned and/or women-owned companies in the state. Challenges remain, but Arizona is reestablishing its reputation as an “opportunity oasis” for newcomers from across the country and around the world. Among the challenges: education and income gaps between Latinos and non-Latinos that, if unaddressed, could hobble Arizona’s long-term progress. Among the opportunities: Latinos are reinforcing Arizona’s entrepreneurial base, graduating from college in record numbers, climbing the state’s political leadership ranks, and helping rebuild ties with Mexico. The Tucson Hispanic Chamber of Commerce, for instance, is championing this rebuilding effort as “One Region, One Economy, One Border…Unlimited Opportunities” No one knows what the future holds, but Arizona’s economic outlook is bright because the business community at large has come to understand a diverse customer base means a strong customer base, while proving that a firm stance against intolerance coupled with a fact-based argument for inclusive economic and social policies can lead to greater alliances between all Arizonans. 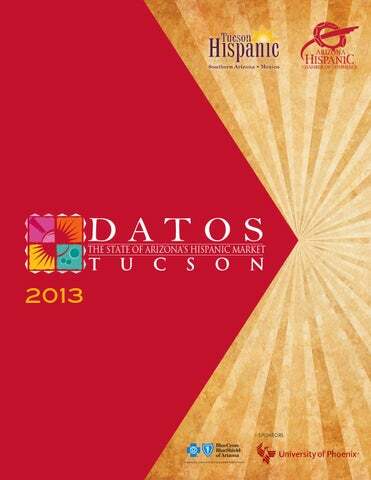 In DATOS Tucson 2013, the terms Hispanic and Latino are used synonymously, as are Native American and American Indian and African-American and Black. White, non-Hispanic is sometimes referred to as non-Hispanic white. Hispanics may be of any race. The information presented here was selected from standard secondary sources. However, data changes quickly and is not always collected annually. Data often offers a static picture of an ever-changing situation. The numbers calculated for any statistic depend on the definitions and assumptions used to produce them. This is a comprehensive compilation of secondary research made available to the AZHCC from various sources. It is used with permission from those sources. Grow your potential. At University of Phoenix, we shape our curriculum around the skills employers are actively seeking, so your studies can prepare you for a brighter future. Get started at our local campus and see how far you can go. University of Phoenix is accredited by The Higher Learning Commission and is a member of the North Central Association (ncahlc.org). The Universityâ&#x20AC;&#x2122;s Central Administration is located at 1625 W. Fountainhead Pkwy., Tempe, AZ 85282. Online Campus: 3157 E. Elwood St., Phoenix, AZ 85034. Purchasing Power In its report, The State of the Hispanic Consumer, Nielsen concluded “Latinos are no longer just a sub-segment of the economy, but a prominent player in all aspects of American life.” To that, we simply say, “¡Si! ¿Por supuesto?” Translation, “Yes, of course!” In the next decade, Latinos will add another 1 million in all aspects of Arizona life. Today, Arizona Latinos are more than one-third of the population and growing fast. In the past 20 years, the Latino population nearly doubled to more than 2 million people. In the next decade, Latinos will be another 1 million people to the population. By 2030, or soon thereafter, Latinos will be a majority of the state’s population. Bigger numbers mean more buying power. The purchasing power of Latinos will top $43.3 billion in 2013 and it is slated to reach $50 billion by 2015—a figure greater than the total gross domestic product of Costa Rica. Total Hispanic purchasing power in the United States will reach $1.5 trillion by 2015, equivalent to the 12th largest economy in the world. The greater promise of Latino purchasing power may be its potential for growth. Demographers estimate that the U.S. Latino population will increase at a rate four times faster than the general population between now and 2050. Today, Latinos are more than 16% of the total U.S. population, but 23% of the nation’s population under 18. That trend will likely continue, given that Hispanic households have twice as many children as non-Hispanic households. Now the nation’s largest ethnic community, U.S. Latinos have become an economic powerhouse within the framework of an increasingly multicultural society. Latinos will account for more than 40 percent of the $3.6 trillion in combined buying power of Latinos, African-Americans, Asian-Americans and Native Americans by 2015. The irony, according to one expert, is that even as U.S.-based corporations seek to cultivate new customers in the world’s major emerging markets, such as China, Russia, India and Brazil, “the per capita income of U.S. Hispanics is higher than [in] any one of those nations.” That income is growing. “Despite the recession, U.S. Latino households that earn $50,000 or more are growing at a faster rate than non-Latino U.S. households,” according to Nielsen. Contrary to popular misconceptions, most of the rapid population growth among U.S. Latinos is due not to immigration but native births, a reflection of the relative youth of the population. Census figures show the median age of U.S. Latinos is 28, nearly 10 years younger than the general market median age of 37. (Most families, incidentally, decide to buy homes in their mid-20s and early 30s, making Latinos a potentially lucrative market for the rebounding housing industry to consider.) Perhaps a byproduct of its bullish population growth, Latinos are apparently bullish on the future of our economy, too. About 60% of Hispanics versus 37% of non-Hispanics “strongly believe” their personal wealth will grow in the next four years. Nationwide, Hispanics are 41% more likely than non-Hispanics to buy a home in the next six months. More than 1 in 4 U.S. Hispanics plans to buy an automobile and 29% plan to buy furniture in that same period. In Arizona, Hispanics are now more than a third of the state’s population and we account for 18 percent of total purchasing power statewide. Market Index: An index demonstrates what is above average (101 or greater), average (100) and below average (99 or less) of a given demographic. Blue Cross Blue Shield of Arizona DATOS INSIGHT HELPS ARIZONANS FIND HEALTH INSURANCE COVERAGE In 2013, Arizona Hispanics accounted for $43.3 billion in consumer spending statewide. The growing influence of this important and diverse community cannot be understated. That’s why Blue Cross Blue Shield of Arizona, Inc.1 (BCBSAZ) relies on the Arizona Hispanic Chamber of Commerce (AZHCC) and the resources they provide, such as DATOS. The DATOS report is a major influence as we continually seek to increase the value of our products and services to the Hispanic market. Most recently, we’ve applied DATOS insight to a variety of educational outreach, marketing and community efforts related to the Affordable Care Act (ACA). Spanish version of azblue.com. Spanish-member support line – Mi Consejero Azul. Community partnerships – not only have we supported and advocated for many of AZHCC’s Latino-owned businesses initiatives, we have developed outreach programs with Chicanos Por La Causa (CPLA), Telemundo and Univision to jointly educate the community on the impact of the ACA and the upcoming open enrollment beginning on Oct. 1, 2013. Health Care is changing. How will it impact you? Tax credits are available to pay for insurance immediately. Are you eligible? Open enrollment is Oct. 1 – March 31, 2014. Where can you buy insurance? Through our partnership at AZHCC and its resources such as DATOS, we are better able to collaborate with governments, business and individuals to address this complex public issue, which cannot be solved by a single organization. Health Care Arizona health care experts know Hispanic care consumers remain underserved. Federal data shows Hispanics are the least likely population to carry health insurance. Nationwide, 1 in 4 Hispanics do not have insurance. In Phoenix, 389,626 Hispanics, 30 percent of all Hispanics in the city, did not have health insurance in 2012. Not having health insurance does not mean Hispanics do not use health care services. It simply means that when they do seek medical treatment many either pay out-of-pocket or they wait until they have no choice but to seek emergency medical treatment. For instance, 90 percent of Hispanic families with children say they purchased medications in 2012; about 12 percent of Hispanic women versus 10 percent of non-Hispanic women received maternity care; and 16.5% of Hispanics sought pediatric treatment as compared to 12.5% of non-Hispanics, according to 2012-2013 data collected by Phoenix CBSA Scarborough. Enter the Affordable Health Care Act, also commonly known as Obamacare, which mandates that most people in the United States must have health insurance starting in January 2014. Next year, most individuals will be required to prove that they have health insurance they either pay for on their own, or receive through an employer, the military or an approved local, state or federal government program such as Medicare or Medicaid/CHIP. In October 2013, the federally mandated Health Insurance Marketplace was launched to provide people without health insurance the ability to shop online and compare insurance plans from a wide range of companies. While the website has been beset by technical problems, to help advertise the Affordable Health Care Act, the federal government is running a nationwide media education campaign in broadcast, print and online outlets. In Arizona, English- and Spanish-language television outlets are airing ads about the new health care law. A major target of the education campaign is the Hispanic community because so many are uninsured. In Arizona, 1 in 4 Hispanics, about 500,000 people, do not have health insurance. Many do not carry it because they cannot afford the monthly premiums, work for employers who do not provide insurance or do not believe they need to be insured. In some cases, language barriers are a problem. The Latino community also includes a large undocumented immigrant population, many of whom are low-income and not eligible for government-funded services. To support the federal education effort, AARP Arizona officials have appeared on the Univision and Telemundo networks in Nogales, Tucson, Phoenix and Yuma. People can also learn more by going online to CuidadoDeSalud.gov or HealthCare.Gov. Members of Congress and a wide range of other public officials have hosted informational conferences, public forums and town halls across the state to help explain the new law. Herb Schultz, regional director for the U.S. Department of Health and Human Services, told the Capitol Times newspaper that “state organizations such as local health centers and nonprofits, are paramount to informing citizens of the changes.” Schultz added, “We know not everyone has access to the Internet, so there have been significant dollars provided under the act to expand services for community health centers – a prime and very key way in rural areas and for aging Americans and seniors to be able to get their health care.” Federal health officials are especially determined to get young Hispanics, who often do not believe they will get sick, to sign up for health care. This is a bigger problem in the Hispanic community in part because the median age of Arizona Hispanics is 28 versus 41 in the general market. The Arizona-Sonora Business Resource Guide is a joint effort of the Arizona Daily Star and the Tucson Hispanic Chamber of Commerce. Source: Q2 2012 Nielsen, “State of the Hispanic Consumer,” P.14. Population In 2035, Arizona will mark a milestone in its remarkable, ongoing demographic shift. If census forecasts hold true, by the time a Hispanic child born in Arizona today is a young adult he or she will be a member of the state’s majority population. Today, Arizona’s more than 2 million Latinos are 31 percent of the total population—more than double the number of Hispanics who lived here in 1990. Between now and 2035, the Hispanic community is expected to double in size yet again to about 4 million people, or more than 50 percent of all Arizonans, based on census data analysis by Pew Hispanic Research. On the national level, the Hispanic population has topped 53 million people, or 17 percent of the population, and demographers predict Hispanics, who can be of any race, will be 30 percent of the U.S. population by 2060. Arizona’s Maricopa County, which includes Phoenix and several major suburbs, is home to more than half of the state’s Latino population. As the country’s minority communities grow, the non-Hispanic White population will peak in 2024, and non-Hispanic Whites skew older and have fewer children. Latinos tend to be comparatively younger and have more children. The median age for Whites is 41; African-Americans, 32; Asians, 31.6; and Latinos, 27. America in 2050, long known as a nation of immigrants will become a nation of minorities, as the non-Hispanic White share of the total U.S. population dips to 47 percent. Non-Hispanic Whites today are about two-thirds of the country’s population. In 1960, they were 85 percent of the population. Population growth among non-Hispanic Whites already has slowed to a crawl. Between 2000 and 2011, the Non-Hispanic White population grew only 1.5 percent, while Hispanics increased by 46 percent. Most Latino population growth today, contrary to popular belief, is attributed to native births and not immigration. While 35 to 40 percent of the country’s Hispanic population today is foreign-born, U.S.-born Latinos account for 90 percent of Hispanic population growth. In a stark example of these contrasting trends, about 80 percent of senior citizens today are Non-Hispanic Whites, while minority babies born in the U.S. outnumbered White babies for the first time in 2011. The implications of these trends are far-reaching. As the White population ages, the nation’s workforce-aged population will become increasingly minority. At the same time, a greater number of jobs in the U.S. labor market will require more training and education. How our nation addresses today’s gaps in educational achievements between Whites and NonWhites will affect our economic and overall societal development. Arizona Market Snapshot The Arizona Hispanic population continues to represent a substantial portion of the stateâ&#x20AC;&#x2122;s population, accounting for close to one-third of Arizona residents. The 2013 statewide Hispanic population exceeds 2 million individuals. Arizona Hispanics are primarily of Mexican ancestry. 52% of all Hispanics may be considered bicultural or less acculturated. Aggregate household expenditures (all consumer products and categories) among Arizona households exceeds $23.8 billion annually, 18% of total. Hispanics represent the second-largest population group in the state at close to one-third of total. Fully 53% of the Hispanics in the Phoenix DMA are ranked as HA3, HA4 or HA5 and 25% fall into the Bicultural category of the Hispanicity segmentation model..
HA2: Nueva Latina English preferred (some Spanish) Born in U.S.; 2nd generation Some Hispanic cultural practices; often “retro-acculturate” HA3: Bicultural Bilingual (equal or nearly) Immigrant as child or young adult Many Hispanic cultural practices HA4: Hispano Spanish preferred (some English) Immigrant as adult, in U.S. 10+ years Pre-dominant Hispanic cultural practices HA5: Latinoamericana Spanish dominant (nearly no English) Recent immigrant as adult (less than 10 years ago) Primarily Hispanic cultural practices Identify with home country more so than U.S.
P. 888.211.9353 | E. geoscape@geoscape.com | URL. www.geoscape.com Source: Geoscape American Marketscape DataStream™ and/or Consumer Spending Dynamix™ Series 2013 The Designated Market Area (DMA) boundaries are defined by Nielsen. This Market Snapshot is produced by Geoscape using the Geoscape Intelligence System (GIS) and the American Marketscape DataStream™ Series 2013 and Consumer Spending Dynamix™ Series 2013. For a FREE test drive of GIS, point your browser to: http://gis4.geoscape.com/testdrive/ Copyright 2013© All rights reserved. Reproduction rights are granted provided the material is reproduced in its entirety and sourced to Geoscape and the American Marketscape DataStream, Series 2013. P. 888.211.9353 | E. geoscape@geoscape.com | URL. www.geoscape.com Source: Geoscape American Marketscape DataStream™ and/or Consumer Spending Dynamix™ Series 2013 The Designated Market Area (DMA) boundaries are defined by Nielsen. Phoenix Market Snapshot The Phoenix Metro Hispanic population continues to represent a substantial portion of the local population, accounting for close to one-third of Phoenix residents. The 2013 metro Hispanic population exceeds 1.3 million individuals. Phoenix Hispanics are primarily of Mexican ancestry. 52% of all Hispanics may be considered bicultural or less acculturated. Aggregate household expenditures (all consumer products and categories) among Phoenix Hispanic households exceeds $15.9 billion annually, 18% of total. Hispanics in the Phoenix Metro area account for 31% of the local population and represent the second largest ethnic group. HISPANICITY HA1: Americanizado English dominant (nearly no Spanish) Born in US; 3rd+ generation Few Hispanic cultural practices HA2: Nueva Latina English preferred (some Spanish) Born in U.S.; 2nd generation Some Hispanic cultural practices; often “retro-acculturate” HA3: Bicultural Bilingual (equal or nearly) Immigrant as child or young adult Many Hispanic cultural practices HA4: Hispano Spanish preferred (some English) Immigrant as adult, in U.S. 10+ years Pre-dominant Hispanic cultural practices HA5: Latinoamericana Spanish dominant (nearly no English) Recent immigrant as adult (less than 10 years ago) Primarily Hispanic cultural practices Identify with home country more so than U.S.
Tucson Market Snapshot Tucson Metro Hispanics represent a substantial portion of the population, accounting for more than one-third of local residents. The 2013, the population of Tucson Hispanics exceeded 360,000 of the more than 1 million people in the community. Tucson Hispanics are primarily of Mexican ancestry. Half the Hispanic population be considered bicultural or less acculturated. Aggregate household expenditures (all consumer products and categories) among Tucson Metro Hispanic households approaches $4.4 billion annually, 23% of the metro total. Over one-third of the Tucson Metro population is of Hispanic ancestry. Tucson’s population is evenly divided between the more acculturated and the bicultural & less acculturated segments. Market Snapshot The Yuma Metro population has a majority Hispanic presence, accounting for 62% of the metroâ&#x20AC;&#x2122;s 200,733 persons and driving the local population growth. Yuma Hispanics are primarily of Mexican ancestry. 58% of all Hispanics may be considered bicultural or less acculturated. Aggregate household expenditures (all consumer products and categories) among Flagstaff Hispanic households exceeds $1.2 billion annually, 44% of total. Metro Yuma’s population is driven by the local Hispanic presence, at 62% of all residents. Communities are like families When everyone comes together, wonderful things can happen. This event is the result of a lot of hard work by many talented people. The spirit of community is alive and well, right here and now. DATOS , you represent the heart and soul of true community. People helping people and local business owners achieve their financial goals! Morrison Institute Latino Public Policy Center Think of Arizona demographics as an hourglass. By pulling together, we can accomplish great things. All of us at Anheuser-Busch proudly support the Arizona Hispanic Chamber of Commerce for leading the way. One surprising result: Only three companies out of the 380 surveyed mentioned SB 1070, the state’s 2010 immigration bill, as being a challenge to them, though it must be noted that the people surveyed were not directly asked a question about SB1070. The three responses came from the open-ended question asking about the challenges they face. Nearly 3 million Hispanic-owned businesses in the United States generate annual combined revenues of $420 billion. NORTH AMERICA: A REGION OF OPPORTUNITIES A new era of opportunities stands before the region North America is and should remain a region of opportunities for all. Under the North American Free Trade Agreement (NAFTA), bilateral trade and investment within the region have grown exponentially. In 2012 alone, Mexico-US total trade reached 494 billion dollars â&#x20AC;&#x201D;more than 1.3 billion dollars per day, almost 1 million dollars per minute. Mexico is the third largest US trading partner. Positive dynamics are now in place, benefitting both societies. The Mexican market is fundamental to the US economy In 2012, US exports to Mexico were 216.3 billion dollars. This is more than the 210 billion dollars of combined US exports to all the countries with which it has a trade agreement in place (excluding Canada). It is more than U.S. exports to Japan and China combined (180.6 billion dollars) and the sum of its exports to France, Germany, the Netherlands and the United Kingdom (175 billion dollars). Exports to Mexico maintain and create jobs in the United States The US Government estimates that each additional billion dollars in new exports supports more than 6,000 new jobs. Exports to Mexico increased 18 billion dollars in 2012 alone, thus potentially helping create over 107,000 new US jobs. Almost six million US Jobs rely on trade with Mexico, according to the US Chamber of Commerce. US states benefit from exports to Mexico In 2012 Mexico was the main destination for exports of 3 US states (Arizona, California and Texas), the second destination for exports from 20 states and was ranked one of the top-five export destinations for 34 states (2012 data). 17 states send more than 10% of their exports to Mexico. Mexico and the United States compete together in the global economy Production and supply chains in North America are deeply integrated. The US content of Mexican exports to the US is estimated at around 40%. In contrast, it stands at about 25% for Canadian exports, 4% for China and only 2% for the European Union. Investment flows are mutually beneficial According to data compiled by the USTR, sales of services in Mexico by majority US-owned affiliates were 34.4 billion dollars in 2010. Sales of services in the United States by majority Mexico-owned firms were 4.8 billion dollars. Mexico is a global player The Mexican economy is open for business. The country has one of the largest trade and investment agreement networks in the world: 12 free trade agreements with 44 partners, 28 international investment agreements and 9 trade agreements that cover important sectors. These allow for privileged access to markets in the Americas, Europe and Asia. Mexico is part of the Trans-Pacific Partnership (TPP) negotiations and has launched alongside other Latin American countries the ambitious Pacific Alliance liberalization mechanism. MEXICO IN MOTION: PROGRESS AND STRUCTURAL TRANSFORMATIONS Even within 2012’s complex global context, Mexico’s economy grew 3.9%. It is ranked as the 13th largest in the world. If current trends continue, it could become the 8th largest by 2050, according to projections made by Goldman Sachs. At the beginning of the new Administration, the major political forces signed the “Pact for Mexico”, a set of agreements that reflect a shared commitment to promote economic development and social welfare. OUR COMMON BORDER: AN AREA OF PROSPERITY AND COMPETITIVENESS Our border is more dynamic and secure than it has ever been Over the last few years, our common border has increasingly become an area of prosperity and regional competitiveness. The total population of the border municipalities and counties, on both sides, is 14 million people. The ten border states in Mexico and the United States would constitute the world’s 4th largest economy. Mexico and the United States continue to work closely together on a day to day basis. Much remains to be done, but our countries’ progress can be objectively measured. Bilateral cooperation is stronger than ever in areas such as infrastructure development, security and trade facilitation. Positive dynamics are now in place, benefitting both societies and our common values and cultural ties are nowhere more visible than at our shared border. The level of ongoing cooperation between Mexico and the United States on border issues is a testament of the maturity and strength of the bilateral relationship. A SMARTER BORDER AND HISTORIC INVESTMENTS IN INFRASTRUCTURE Better use of government resources, greater cooperation Smart and common sense approaches improve the quality of life and trade at the border. Mexico and the United States work towards ensuring regional security and agile inspection procedures. Several programs contribute to these goals: FAST, SENTRI, Ready Lane and Global Entry, to mention a few. The Single Rail Manifest allows companies to send their manifest, simultaneously and electronically, to customs authorities of both countries. More bridges, more trade The border between Mexico and the United States is one of the busiest in the world, with 56 ports of entry. Around 1 billion dollars is traded every day and 300,000 vehicle crossings take place (including 70,000 trailers). Three new border crossings are in operation as of 2010, two between the states of Texas and Tamaulipas and one between Arizona and Sonora. The crossing between Boquillas del Carmen/ Big Bend binational park, between Texas and Coahuila, began its operations last April. In the coming months, the first new railway crossing in over 100 years will be inaugurated. Modern crossings for modern cities San Diego and Tijuana are increasingly intertwined. Both cities, together, have become a hub for manufacturing with a strong presence of high technology businesses. A new southbound crossing at Tijuana —San Ysidro, “El Chaparral” (October 2012) is in operation, expanding capacity and using non-intrusive inspection devices to facilitate the movement of people and goods. The northbound crossing project remains a priority for both countries, along with the establishment of a pedestrian access point in the United States to the international airport in Tijuana. MEXICANS IN THE UNITED STATES: THE IMPORTANCE OF THEIR CONTRIBUTIONS The Mexican population is an engine for the US economy and society The 11.7 million Mexicans living in the United States in 2011 represented 29% of immigrants and 4% of the US population. Most Mexicans live in California (37%, 4.3 million) and Texas (21%, 2.5 million), the two largest state economies. According to the Migration Policy Institute, based on data from US Census Bureau, the cities with more Mexican immigrants are Los Angeles (15%, 1.7 million), Chicago (6%, 684,000) and Dallas (5%, 610,000), whose economies grew faster than the national av"Our nation has always been improved by erage in 2011. Mexicans, including 2nd and 3rd immigrants seeking the freedom to grow, generations, contribute approximately 8% of US prosper and innovate. Nowhere is that GDP (BBVA Bancomer Foundation, 2012). Mexican immigrants are entrepreneurs that create jobs 40% of the companies included in Fortune 500 were founded by first and second generation immigrants, creating 10 million jobs. According to a study by the Partnership for a New American Economy (PNAE), 28% of the businesses established in 2011 are owned by immigrants and employ 10% of US workers. Mexicans make up 12% of the immigrants that own a small business. Around 570,000 businesses in the United States, more than 1 in 25, are owned by a Mexican immigrant and together they generate over 17 billion dollars in revenue per year. According to the Center for American Progress, immigrant women are more likely to have their own business than women born in the United States, 9% versus 6.5%. The Hispanic market is critical to US prosperity Hispanics are the largest minority market in the country and global US consumer spending drives 70% of US GDP. According to a study by the Selig Center at University of Georgia, Hispanics’ purchasing power may exceed $1.5 trillion in 2015, about 11% of the US total. In 2009, the average monthly wage of Mexican workers in the United States was 2,190 dollars and the average monthly amount of a remittance was 317 dollars. Therefore, more than 87% of Mexican workers’ wages were spent in the US economy (Center for Latin American Monetary Studies, CEMLA and Banco de Mexico). ARIZONA-MEXICO: QUICK ECONOMIC TIES Arizona’s export shipments of merchandise in 2012 totaled $18.4 billion. The state’s largest market was Mexico. Arizona posted merchandise exports of $6.3 billion to Mexico in 2012, 34.2 percent of the state’s total merchandise exports. Mexico was followed by Canada ($2.2 billion), China ($1.3 billion), Japan ($920 million) and the United Kingdom ($915 million). Acculturation Marketing to U.S. Hispanics requires understanding role of acculturation Experts say effective marketing campaigns must consider range of culturally rooted traits, values and behaviors of Hispanics What is acculturation? Acculturation is the process by which individuals of one cultural group, typically a minority group and often an immigrant group, adopts elements of the larger culture/community. This process may include the adoption of the larger culture’s attitudes, values, customs, beliefs and behaviors. For some groups, this may also include changes in language preference. Fundamental to acculturation is its distinction from assimilation, which is the total adoption of the larger culture at the cost or dismissal of the original cultural traits. Individuals who are in the process of acculturation may or may not ever totally discard key elements of their culture of origin. In fact, it is most common to develop a blended existence where some elements are maintained. Examples of acculturation in play…. Because acculturation happens at an individual level and over a period of time, it can manifest in a gradual manner. A recent immigrant to a foreign country may hold on fiercely to their home country (native) culture yet adapt some new shopping behavior by visiting supermarkets instead of the local corner market in their neighborhood. The children of that same immigrant may more aggressively adopt elements of the new culture by following new celebrities and fashion, adapting new foods and language quite quickly. Why does acculturation matter? The traits, values and behaviors of one’s native culture are filters that impact comprehension of communications. Messages that are not relevant cannot resonate, which seriously reduces the effectiveness of a marketing campaign. For marketers, careful attention to both language and acculturation are essential to success. Since a large share of the Hispanic population in the U.S. will continue to be new immigrants and their second generation children, the acculturation process may not happen has quickly or as thoroughly as with past immigrant groups. Marketers need to be acutely aware that both language and acculturation matter when crafting marketing strategies. Marketers must shift their focus from thinking about whether Hispanics can understand their advertising to creating campaigns that speak to the heart of the Hispanic consumer in the U.S. (Nielsen 2013). How to measure acculturation? Measuring acculturation can be complicated because it is not automatic and not linear – some consumer behaviors acculturate faster than others and the process of acculturation does not take place at the same rate with every person. Many researchers, marketers and advertising agencies in the U.S. Hispanic industry have developed extensive acculturation measurement systems. This includes Nielsen, Geoscape, ResearchByDesign and many more. 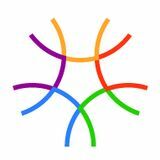 Each group contributes unique and important insight to understanding the factors, attributes and triggers that define acculturation level among U.S. Hispanics. To provide a sample of these methods, we offer a few examples of modeling and methodology. To support the concept that language alone does not define acculturation, Nielsen offers a consumer behavioral acculturation metric that includes self–identity. How do Hispanics in the U.S. see themselves? HA1: Americanizado. English dominant (nearly no Spanish); born in US and often 3rd+ generation; has few Hispanic cultural practices. Some personalities in this segment may include NFL QB Mark Sanchez NFL Quarterback, singer Selena Gomez and actress Cameron Diaz. HA2: Nueva Latina. English preferred (some Spanish); born in U.S. and typically 2nd generation; some Hispanic cultural practices and often “retro-acculturate.” Examples: TV host Mario Lopez, entertainer George Lopez and actress America Ferrera. HA3: Bicultural Hispanic. Bilingual (equal or nearly); immigrated as child or young adult; has many Hispanic cultural practices. HA4: Hispano. Spanish preferred (some English); immigrated as adult and in U.S. 10+ years; pre-dominant Hispanic cultural practices. Examples: actor Antonio Banderas, TV personality Cristina Saralegui and actress Kate del Castillo. ResearchByDesign has also furthered the discussion on acculturation by investigating the intriguing behavior of RETROacculturation. This refers to the search for ethnic identity or roots, especially by second, third, or fourth-generation Latinos who feel they have lost their cultural identity. These individuals are part of mainstream American culture yet would like to enjoy and recover the culture of their parents and grandparents. Hispanics who choose retro-acculturation typically want to learn Spanish, have their children learn Spanish and appreciate their cultural heritage (values, music, arts, food and so on). They are proud of their heritage and welcome ethnic recognition in advertising and promotion of brands and services. As consumers, they may patronize brands that target Hispanics, or may watch Spanish-language TV and listen to Spanish-language programming. They also tend to support Hispanic-related candidates. A sense of ethnic identity and pride tends to motivate these behaviors. This sub-segment of the Hispanic market is growing steadily as the Latino middle class continues to grow. (Hispanic Marketer’s Guide 2008). From many perspectives emerges a singular view From our employees and suppliers to our products and customers– our diversity shows in everything we do and everything we make. Henkel’s commitment to recruiting and developing a diverse workforce creates a truly inclusive corporate culture. It’s an environment where we strive to provide new opportunities for our employees as we drive for leadership in the global marketplace. It’s a place where inspiration leads to growth and achievement...We together. 6th in the U.S. for degrees awarded to Hispanic students ASU is committed to serve Arizona’s educational needs with excellence and impact. We measure ourselves by who we include, not exclude and strive to enhance each student’s performance. ASU consistently ranks among the top 5 in the nation for Hispanic degrees awarded in legal professions, education, family and consumer sciences and education and we have seen our Hispanic student population grow by 103 percent since 2002. Getting Started with Segmentation The goal of any segmentation is to best understand how to optimize communications and product development for your company’s goods and services. An ideal segmentation will take into consideration the specific ways in which your customers interact with your offers and where those fit into their lives. Generally, you’ll want to a solid research organization with segmentation experience to help deploy the approach that fits your specific needs best. However the following can provide a general outline of steps and factors to consider as you get started segmenting your customer base. Align – Make sure that you and your internal team are completely aligned on the precise goal of your segmentation. There are many ways you can filter your base of opportunity so you’ll want to define this as narrowly as possible and keep everyone on track as the project unfolds. A key step in this process is to consider your success metric – how will you know you have succeeded once this process is completed? Assess – Examine your internal data sources for any variables/factors that you can mine to draw into the analysis. Do you currently capture key points on your customers related to their shopping or purchase behavior? Are there other demographic or geographic variables you can or would like to expand on? You will want to identify the most telling variable that is a determining factor in how your products or services are consumed. Analyze – Next conduct an in-depth analysis to identify the groups that exhibit the greatest degree of variance in how they use or consume your products/services. These segments should be distinct enough that individual strategies will resonate with them. However, there should not be so many segments that the opportunity is too narrow and therefore not efficient or manageable to approach. Evaluate – From among the identifiable targets that were identified, determine which present the greatest opportunity and prioritize them. Some areas to consider in this prioritization include the number of customers in the segment, how each group fits with the direction of your organization and its goals and also your ability to impact market share within that segment. Work closely with your marketing communications team to develop strategies that can be tracked and adjusted as needed. This is a key time to revisit the success metrics that were developed in the initial phase to ensure the goal is centered and on point. Evolve – Finally be sure to monitor the market to watch for changes in your key segments related to any trends in the industry or economy. You may also identify additional segments of emerging opportunities that have appeared. Jan 2013. Web. 14 May 2013. 3-4. Web. 29 May. 2013.